Already a registered user? Log in. Owner of Story in Prairie Village, KS. This sauce is simple to prepare and has a balance of straightforward flavors. 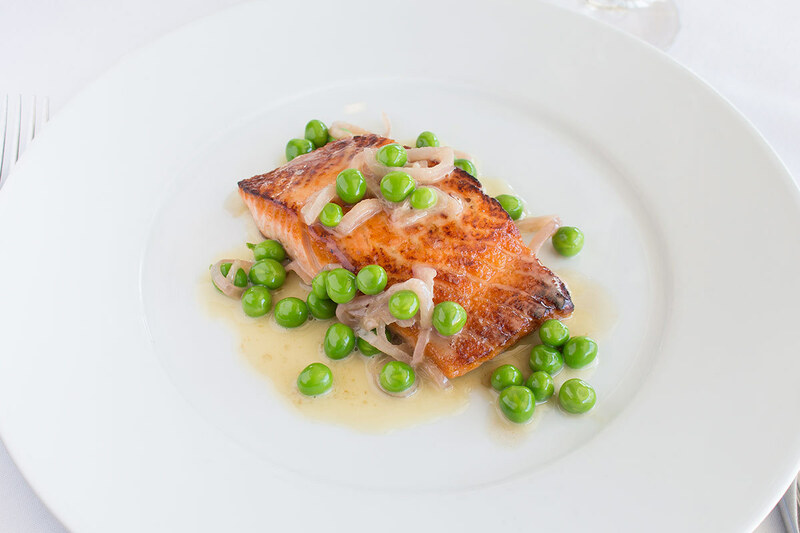 It brings together the ingredients on the plate, adding richness and depth to the seasonal combination of wild Alaskan salmon and English peas. Make the base for the sauce by combining one cup of the chicken stock, half the shallots, the leek, all spice, peppercorns, vinegar, honey, and a pinch of salt in a 3-quart saucepan. Place the pan over medium high heat, bring to a simmer, and reduce until approximately 2 tablespoons of liquid remain. Now stir in the remaining cup of chicken stock and bring to a simmer. Roughly chop the tarragon leaves to release their full aroma. Remove the pan from the heat and add the tarragon leaves and a bit more salt. Leave the tarragon in the liquid for 20-30 minutes, then strain the sauce through a fine mesh sieve. Discard the solids. If not using immediately, refrigerate the liquid. It can be made in advance up to five days. Bring 5-6 quarts of water to boil and season with one tablespoon of salt per quart. Prepare an ice bath. Drop the peas in the boiling water and cook for 30 seconds to 2 minutes, depending on their size and freshness. Transfer them directly to the ice bath to stop them from cooking and to set their bright green color. Use the peas immediately or refrigerate them for up to 3 days. Heat a medium sauté pan over low heat. Add a teaspoon of grapeseed oil and the sliced shallots. Season with salt and cook for 5-6 minutes, until they soften, then add half a cup of the tarragon infused liquid and bring it to a simmer. Separately, place a sauté pan large enough to hold all four pieces of salmon on a very hot burner. Add grapeseed oil to the pan. Season both sides of the fillets with salt. As soon as the oil begins to release a bit of smoke, add the salmon to the pan. Cook the fish on the first side until a crisp golden crust forms, then flip it and cook it on the second side briefly. Leaving the fish in the pan, remove the pan from the burner. The residual heat from the pan will finish cooking the salmon. Test for doneness by inserting a paring knife into the thickest part of the fillet, then pressing the side of the knife blade against the inside of your wrist. If it is warm, the fish is medium rare. To finish the sauce, remove the pan of shallots and tarragon base from the burner. Off the heat, whisk the butter into the liquid. Season the mixture with salt to taste. Add the blanched peas to the pan and place it over a low burner until the peas are warm. Divide the salmon fillets between four plates. Spoon the peas, shallots, and tarragon sauce over the top. Serve. This chicken recipe evokes the classic tastes of fall. This creamy sauce is loaded with herbs and shallots, taking a classic chicken breast to the next level. Are you going keto or trying something new? This dairy, soy, and processed sugar-free coffee is frothy and satisfying.